Dr. Campbell literally changed my life, and I want to thank him! My name is Bruce Mylrea. I am 59 years old and live in Santa Cruz, CA. I was diagnosed with prostate cancer in December of 2011. After a radical prostatectomy and two rounds of adjuvant radiation, I am still fighting prostate cancer today. 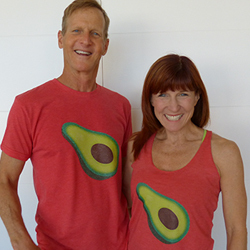 My wife, Mindy, and I have been working together and teaching in the fitness industry for decades. Mindy and I were awarded the 2017 Lifetime Achievement Award by CanFitPro, one of the largest fitness organizations in the world. Our focus in the industry changed dramatically after we both transitioned to a whole food, plant-based diet eight years ago. My cholesterol was at 276. I picked up The China Study just by chance and read it cover to cover. I was shocked and angry that I did not know the information contained in this groundbreaking book. Based on the work of Dr. Campbell and others in the plant-based movement, I decided on nutritional intervention first, and was able to lower my cholesterol by 100 points in 6 weeks simply by transitioning to a plant-based diet. One year after that, I received my cancer diagnosis. I know that my cancer was promoted by my strong adherence to the standard American diet for the first 52 years of my life. Fried animal products had been my preferred choice of poison for as long as I can remember. Mindy has won almost every fitness award to be had including 2016 Instructor of the Year, 2015 CanFitPro Specialty Presenter of the Year, and the 1999 International IDEA Fitness Instructor of the Year as well as National and World Aerobic Champion. She is the creator of the Gliding DiscsTM and Tabata BootcampTM, which earned Most Impactful Fitness Program of 2013. Mindy has starred in over 500 instructional videos. She is an icon in the fitness industry. My original degree is in Economics, and I had a very successful career in high tech marketing. However, since earning my certificate in Plant-Based Nutrition through eCornell, my life’s purpose and mission have changed completely. I now spend hours each day reviewing the latest in unbiased nutritional research. I am focused and passionate about helping to educating others on the life-enhancing and life-extending benefits of whole food, plant-based nutrition. I have been lecturing on plant-based nutrition and evidence based living at major fitness conferences in both the US and Canada for the last 6 years. I reference the work of Dr. Campbell and nutritionstudies.org in every one of my lectures. At the age of 57, I found my true passion. Better late than never! Last year, with strong passion and drive, Mindy and I created a program called One Day To Wellness for fitness professionals and anyone who wants to redirect to a more evidence-based lifestyle. This is a 9-hour certification that emphasizes evidence-based living centered on plant-based nutrition, mindfulness, and behavioral change strategies. One Day To Wellness is approved for continuing education credits (CECs) by every major fitness industry governing body. In 2017 we certified over 400 fitness professionals in this program, and our goal for next year is at least double that number. Here is the bigger news: Mindy and I have purchased a 32′ RV. As you can see, our One Day To Wellness logo is essentially a traveling billboard. We will be living in the RV and traveling across North America to certify fitness pros and their clients in our evidence-based living and nutrition program. We will also be providing free lectures as part of our non-profit mission. 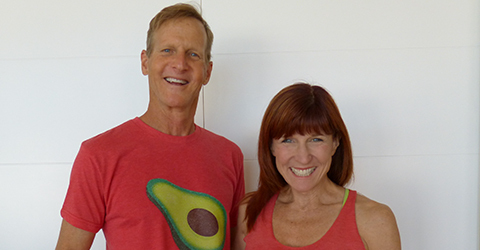 Our goal is to train an army of “Wellness Warriors” in mindfulness and plant-based nutrition. Every fitness pro has the ability to influence hundreds of clients, making them a perfect conduit for the evidence-based nutrition message. But this program is not just for fitness pros, even people who are not in the fitness industry have the potential to encourage those around them to “lean to the green” as we like to say. Please check out onedaytowellness.org to learn more about our mission or to contact us about scheduling a free evidence-based nutrition lecture for your community.